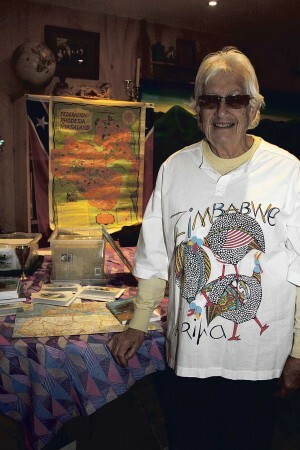 Otaki resident and author, Marion Rego, recently released her latest book, Africa for One, telling of her time in parts of Africa in the 1960’s. Content for her book came from memories and letters sent home to her parents, sister and brother-in-law, which her mother had stored in shoe boxes. Compiling the book was a family affair; grandson Oska Rego painted the front cover design and family members contributed many of the illustrations, which were added to photographs Marion took during her years in Africa. As a young teacher, she gained a six week teaching position in Northern Rhodesia, which she found most interesting, followed by a position in a coloured school in Nyasaland. Many friends in Southern Rhodesia, which became Zimbabwe, were arrested, deported, and some were killed. During school holiday times, she drove her VW Beetle from South Africa to the Equator, she drove alone carrying everything she owned or needed with her. “I had one or two punctures, but I learnt to change a tyre on my own and people were always there to help, too” she said. “Things happened in Nyasaland, but I never felt in danger. …. I was in a safer place, and I felt close to those people.” Apartheid rules in the 1960’s South Africa and Rhodesia were very strict “I broke them all”. Nyasaland – which became Malawi in 1964 after gaining independence, was a very different country then, poor and still poor, it was not settled in the same way Zimbabwe was settled.